Canada Sound 150 is a very interesting project sponsored by CBC. 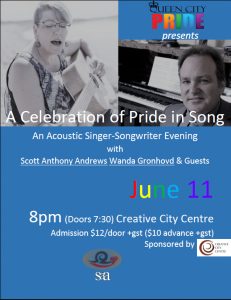 The idea is that Canadians submit actual sound snippets to the Canada Sound site to inspire/challenge songwriters to use these audio clips as the basis for a song. The hope is that “Canadian musicians create the ultimate national soundtrack.” Indeed, interesting sounds have been submitted: the sound of KD as its leaves box and leaps into boiling water, the sizzle of bacon, the sound of a cottage door closing, loons….. 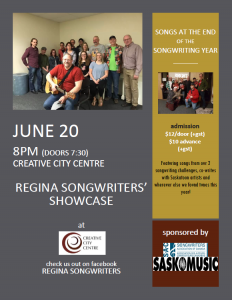 When I was thinking about which sound, I considered that I am a singer-songwriter in Regina, a prairie city. I really wanted to write/build a song around a sound that is—if not unique to my city—is at least very common here. I settled upon the sound of a street sweeper. Prairie cities are naturally dusty; they are often oases within surrounding sandy prairie. Further, Regina does not use much salt for winter traction, as salt generally will not melt ice below -15C, which is nothing for a prairie winter. Regina uses a sand/salt combination….so more sand on the roads. 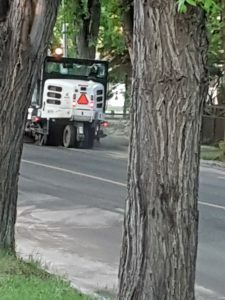 Hence, spring cleaning in Regina involves not just one, but a parade of street sweepers—several in a row that go up and down, up and down, up and down your street. Other cities have them as well, though they seem not quite as springtime ubiquitous as on prairie city streets. So, I wrote this song in a way that literally describes the “Parade of Street Sweepers” that spring clean my street. You may notice that the intro gradually builds in volume, as though you were watching a parade as its gets closer and closer. Having said all that, this is my first try at music production. I have released two CDs and am about to release my third “I Don’t Do Lazy Like That.” Each CD was professionally produced by Ross Nykiforuk, and my latest was professionally mastered at Carvalho Mastering in TO. This was an interesting challenge posed by Canada Sound 150, and I am glad that I accepted it, even knowing it was my first attempt at music production. …and there you have it; my contribution to Canada Sound 150.